Gadora’s color palette would be more subdued, but the idea of openly displaying shoes is very enticing. I’m proud of MY collection, and YOU will all have to look at it. Miley’s huge mirror is a lovely accent. And she has skates too. Love. It wasn’t until I moved to Park Slope, years ago, that my own collection was first exploited. Turning the teensy bedroom (had a queen-sized bed been in it, there’d be room for nothing else!) into my walk-in boudoir, I utilized a couple of heavy-duty cubicles (with 32 cubbies) from the nearby Target and filled them with my shoes, by function and color, natch! Gadora stored like colors, similar heel shapes, sneakers, skimmers, etc. all in their clear-box cubbies and saved room for bags. Back in Texas, I plan to design my new closet around the adage, bigger IS better. You’ll see. Stylist and shoe designer Elisa Nalin has a few shoes herself. It’s not clear if these are for an editorial shoot, or from her own collection, but the lady has some shoes! It has long been noted that Mariah Carey has a shoe thing. As evidenced by the below spread, she does glamour good. Her shoes are prominently displayed and easy to get to. Hers, too, sports a chandelier. Having never seen Christina Aguilara in flats, it’s little wonder she needs a library ladder to reach the upper deck of her closet. What a spread. Though slightly garish, she still knows the idea is to put one’s shoe obsession right out in the open. There were several online “tips” for snapping your shoes pics and taping them to the front of their original box, but I’ve always been an instant-gratification girl. I want at my shoes. NOW. And after all that, perhaps it is Jane Aldridge of Sea of Shoes, also a Texas girl, who stores hers best. Simple. And Clean. Posted on November 24, 2009 November 24, 2009 by gadorawilderPosted in MusingsTagged Architecture, Do-it-Yourself, mid-century modern, Shabby Chic, shoes. Hey there….good to see you this past weekend. 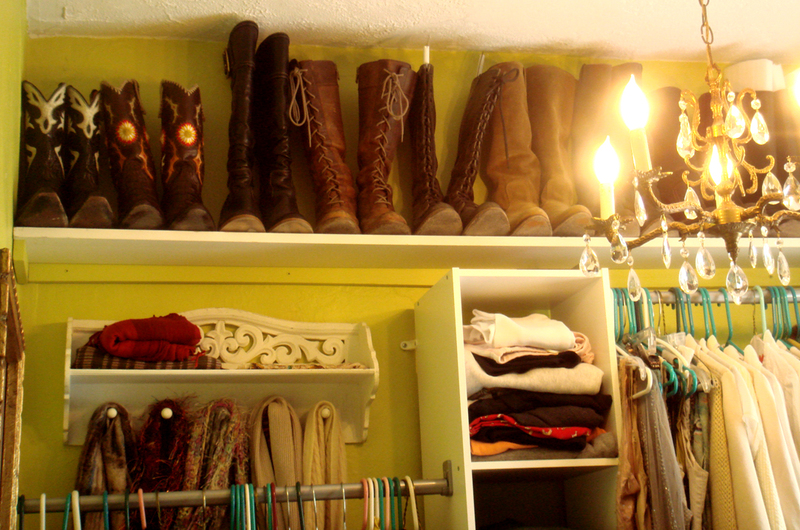 This post makes me want to re-do my closet and everything in it! I am sick of it all, especially my shoes! Fun to look at the pictures and dream!